Mick & Mack - Global Gladiators was released on the Genesis in late 1992, but a SNES version never materialized despite the fact it was worked on. 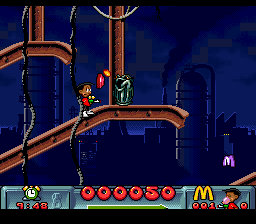 Mick & Mack was a McDonald's licensed game developed by David Perry at Virgin Games. 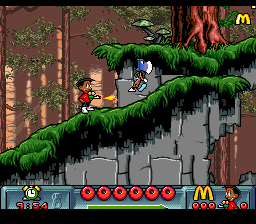 It appeared on various Sega systems and the Amiga, though they cancelled the SNES version. It is a platform shooter game with an environmental theme. The game was shown at the Winter 1993 CES, apparently after the Genesis version was already out. If I were to venture a guess, it was not completed because it would have come out too long after the Genesis verison, and possibly too close to the release of Cool Spot. 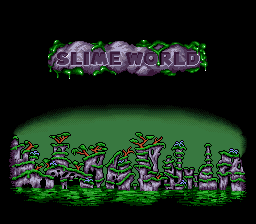 The in-game copyright screen says 1993, so it was almost certainly in development after the Genesis version was already release. 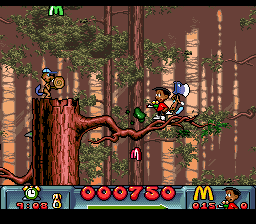 A prototype ROM image of this game shows that it was at a late alpha or beta state. It was released by a BBS group known as Sabotage. They hacked the initial splash screen, which includes a level select function. 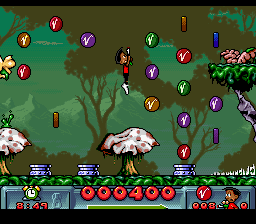 The original file name from my BBS archive states that it has a trainer, but I believe that the level select was a feature of the original binary, as it is not possible to beat the levels. 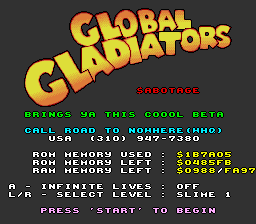 The ROM image that has been floating around in ROM sets has actually been hacked to remove the phone number from the initial screen, but whoever did that also failed to remove the name of the scene release group. When you first load the game, there is a bunch of debug stuff, which allows you to choose various levels. 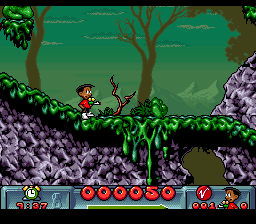 The levels seem to be pretty much complete, but there isn't really much you can do. Most enemies are static and do not harm your character. You can use the L button to float around the levels, which is very necessary since pits do not kill you. 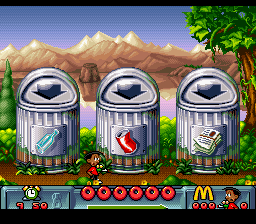 Pressing the R button skips you to the bonus stages for each level. Pressing start will take you back to the level select menu, which is required because you can't actually exit the levels normally. Visually, it doesn't look all that different from the Genesis game. 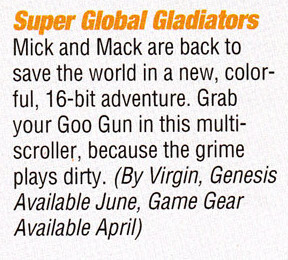 Preview in the April 1993 (page 129) issue of Gamepro, with the title "Super Global Gladiators"